The ISS passed through the “Big Dipper” August 23, 2012. Photo by Chris Christie. 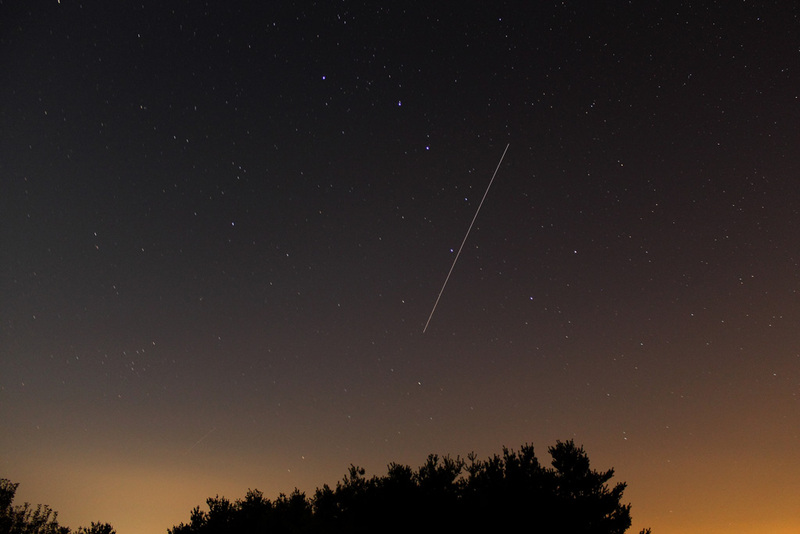 There was a bright, beautiful pass by the International Space Station the night of August 23, 2012. Alerted by CAA member Jay Reynolds, fellow member Chris Christie set up his camera and got an excellent shot of the station’s arc. That night’s pass was of the “fading” type; the space station rises above the horizon reflecting sunlight and, due to the Sun’s angle and the projection of Earth’s shadow into space, crosses into that shadow while still very high in the sky. The path of the ISS, as viewed from Northeastern Ohio, took it right through the Big Dipper asterism. Light pollution provides color above the horizon. Christie’s photo data: Canon EOS Rebel T3: ISO 800, f/3.5, 18mm, 55-second exposure started at 9:39 PM. This entry was posted in Uncategorized and tagged astrophoto, CAA, constellations, ISS, northeast ohio, northeastern ohio, photograph, space station. Bookmark the permalink.